At this time, the final presidential results are still being tallied. But plenty of Illinois and Chicago races have been decided. Check out our full wrap-up of the races. We have also updated our photo gallery, which you can view here. The mood has changed drastically at the Hillary Clinton viewing party at Sidetrack Bar in Boystown, as Donald Trump wins state after state. The night started as a raucous, festive pre-celebration of Hillary Clinton’s expected victory. But the evening has turned into a heavy, anxiety-filled and completely stunned atmosphere. Hillary supporters have filed out of the bar, expecting defeat, and the viewers who remain have their eyes glued to the TV screen. Every once and a while, shouts like “Seriously, America?” and “I’m going to have a heart attack!” break the silence. Even Sam Chepulis, a market researcher who voted for Libertarian candidate Gary Johnson, said he thought Clinton would win. He wasn’t following the election closely earlier in the evening but when he entered Sidetrack, the depressed atmosphere revealed the tide had turned. “Hillary had her firewall,” he said, referencing the argument that Clinton would need to win the states of Michigan, Wisconsin, Virginia, Colorado, and New Hampshire, in order to win the election. Trump is currently leading in Wisconsin, Michigan, New Hampshire and Pennsylvania, and Clinton has won Virginia. “But apparently that was about as secure as her email server,” he added. Democratic candidate Brad Schneider emerged victorious in the race against his three-time rival Republican Rep. Bob Dold to clinch the north suburban 10th district seat for Congress. Dold first won the seat in 2010, lost it to Schneider in 2012, before winning it back in 2014. Republican presidential nominee Donald Trump held up a rainbow flag that said “LGBT for Trump” last week, and earlier in his presidential campaign suggested that he was a better candidate in terms of LGBTQ issues. “Ask the gays,” he said. We did. And some voters in Chicago’s LGBTQ community aren’t buying it. The Indiana Governor, who is also the Republican nominee for vice president, has consistently opposed marriage equality and has advocated for the use of conversion therapy to try to change people’s sexual orientation. “He’s just doing it to pander to a minority group for votes,” agreed Christian Lum of Rogers Park, a manager at an import shop who was at Sidetrack’s election viewing party. Trump took the lead in electoral votes Tuesday night midway through election eve until a CNN projected win in California at 10 p.m. gave Clinton 190 electoral votes to Trump’s 171. But the cliffhangar race promised a long night. “If Trump wins, this place is going to burn down,” said Jerome Brzezinski of Lincoln Park, a web and publications designer for a Chicago-area university. Republican candidate Donald Trump managed to clinch victory in key state, North Carolina and Florida – the biggest swing state in the presidential election – Associated Press reported. With 29 electoral college votes, the state wields significant electoral clout and could make or break a presidential candidate’s chances. Posted at 10:03 p.m., updated at 10:17 p.m. Correction: An earlier post erroneously suggested that voting in 60 percent of Chicago precincts concluded. We have updated this post with correct information. Voting in 66 percent of Chicago precincts concluded by around 7.30pm, according to the Board of Elections spokesperson Jim Allen. Allen said that they were expecting an overall turnout of at least 70 percent. In 2012 the Election Board recorded a turnout of 75.41 percent, and 73.87 percent in 2008. Medill Reports has been covering Election Day in Chicagoland. Here is a list of the most recent posts on various local races and aspects of the election. Election update: What happens after election day? Congresswoman Tammy Duckworth has unseated U.S. Sen. Mark Kirk, R-Illinois, ABC News projected. Mood in the basement of the Renaissance Hotel, in Northwood, Ill, where Kirk’s supporters have gathered, changed precipitously as the results were acknowledged by the incumbent senator’s supporters, who had virtually prepared for the dismal outcome. In his concession speech, the Republican leader thanked his campaign staff, adding that he had called Duckworth to congratulate her over her victory. “I hope opponents can bury the hatchet,” he said. Earlier in the day, the GOP leader acknowledged that he was fighting an uphill battle against his opponent, U.S. Rep. Tammy Duckworth, D-Ill.
Medill reporter Duke Omara was in Highwood in the morning, where GOP Sen. Mark Kirk of Illinois cast his vote. Breaking away from tradition and party norms, Kirk voted for Gen. David Petraeus for president instead of his party’s nominee, Donald Trump or Democratic nominee Hillary Clinton. The Associated Press just announced that Hillary Clinton won the presidential race in Illinois by a significant margin. According to the unofficial results, Hillary clinched over 69 percent of the popular vote, with Trump trailing far behind at 26.47 percent. With this victory, Hillary will clinch all of Illinois’ 20 electoral college votes at stake, increasing her chances of winning the election. The #NeverTrump app allows voters to trade votes in order to increase Hillary’s chances of winning while allowing others to vote their conscience. Citizens found another innovative way to make their vote count: by trading votes with those who are in states where they are needed most. 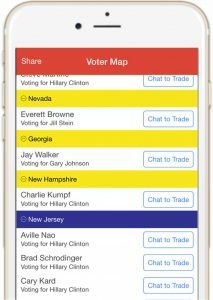 The #NeverTrump app allowed people across state lines to pair up and vote their conscience, without allowing their votes to take a toll on the overall result. The idea was simple: If a voter in swing state, Florida, wished to cast a ballot for Jill Stein or another third-party candidate, the app would pair that person with someone in a safely Democratic state where the loss of a single vote would not seriously impair Hillary Clinton’s chances. In this case, the voter in Florida would vow to vote for Clinton in exchange for the other person’s promise to vote for the candidate of his or her choice. Voters simply downloaded the app, answered four questions, and joined a chat room. The app, which is available on iOS  then gave users a vote trade match immediately. A popular metaphor used to describe the Latino vote says it is the sleeping giant of electoral politics. It seems this year, the giant woke up. And it is not happy. While some Latino voters in Chicago came out to vote for Hillary Clinton, many also came out to vote against Donald Trump. Blanca Sanchez of Little Village is a stay-at-home mom of three girls. She says she’s never paid attention to politics and she’s never voted, but this election has motivated her to vote for the first time. Some Latino voters have also been paying attention to Trump’s xenophobic rhetoric. A survey taken in August by Latino Decisions found that 74 percent of Mexican-Americans thought Trump makes the GOP more hostile to Latinos and only 9 percent said he makes it a more welcoming party. Marcelino Villalobos, 38, of Little Village, says she disagrees with his policy of mass deportations and that immigrants greatly benefit her community and country. Even some local elected officials showed up to the polls and spoke out against anti-immigrant policies. “All politics are local and if you want to build a walk it better be built around a candidacy that talks about inclusion,” said Alderman Ricardo Muñoz (22), who was at the Lázaro Cárdenas Elementary School in Little Village. The Texas Tribune reported today that five Texas counties rank among the top 10 nationwide for closing the greatest percentage of their polling places since the U.S. Supreme Court struck down a portion of the Voting Rights Act in 2013. The Tribune reported that Texas leads the nation in the number of polling places that have been closed since ruling. The Court effectively struck down the heart of the Voting Rights Act of 1965 by a 5-to-4 vote, freeing nine states, mostly in the South, to change their election laws without advance federal approval. 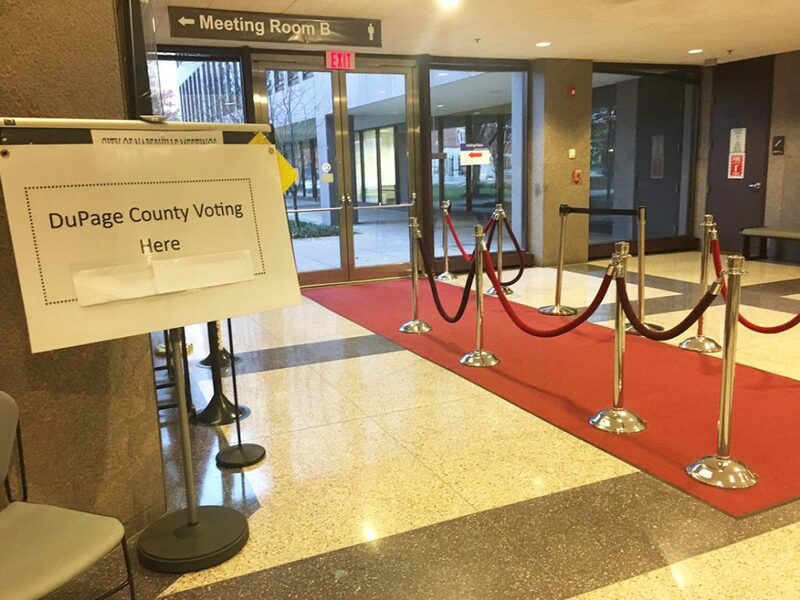 Though there were few people voting in the final hours of Election Day at the Naperville Municipal Center, some voters had strong opinions about their choices. Mark Kauffmann voted for Hillary Clinton. He said it would be impossible for him to consider voting for Donald Trump. “To think that there are so many people of that ilk that would vote for Donald Trump…it’s unbelievable,” he said. “It’s a woman and I think it’s time,” she said. Representative Jan Schakowsky of Illinois’ 9th district, who’s running for re-election this year, is among the millions of Americans anxiously awaiting the outcome of the election. “He shouldn’t win – he’s unfit in every single way to be president. This man cannot be a role model for our children. He’s dividing our country and demeaning so many people – people with disabilities, Muslims, Mexicans, immigrants, African Americans, it’s just incredible to me,” she said. With this election Schakowsky, hopes to push forward her bill that would create a public health insurance option for the Affordable Care Act. The act has caused premiums to increase for her constituents in Illinois, she said. It takes 270 votes in the electoral college to win the presidency. The following map is based on the Five Thirty Eight election forecast. We’ll update it as official results come in after the polls close. Red means Donald Trump is likely to win that state, and blue means Hillary Clinton is likely to win. Keep an eye on the following battleground states in purple: North Carolina, Florida, Ohio, New Hampshire and Nevada. Polling suggests some states that were once considered swing states, including Colorado and Pennsylvania, are currently leaning in favor of Clinton. Voter turnout has been lower than expected so far, said Technical Judge Alton Mitchell at the Naperville Municipal Center polling place. He estimated turnout was around 50 percent, but 25 percent of all voters at this polling location turned out for early voting instead of waiting until Election Day. Early voting lines were open at the municipal center until 11 p.m. last night, he said. “I think people just can’t wait for it to be over,” Mitchell said. At least 930,884 (57.6 percent) registered voters in Chicago had cast their vote by 4:26 p.m., according to the Chicago Board of Elections spokesperson Jim Allen. Authorities are expecting the overall turnout to meet or exceed the 2008 and 2012 elections when over 70 percent of registered voters had cast their vote. The surge in voters in Chicago is largely led by millennials, with 176,174 voters between the ages of 25 and 34 having cast their vote by 1:45pm, DNAInfo Chicago reported Chicago Board of Election Commissioners Chairwoman Marisel Hernandez as saying. Moreover, over 400,000 votes had already been cast in Chicago at early voting stations or by mail before polling even commenced on Tuesday. There are more than 8 million registered voters in Illinois, even more than the 7.8 million who were registered before the 2008 presidential election, the previous high since 1970. Benedictine University in Lisle, Ill.
Kellen McCullum, a junior at Benedictine University in Lisle, Ill., voted for Hillary Clinton three weeks ago. As a political science and business major, he felt Clinton’s financial proposals were best for the future of the country. He was less impressed with Donald Trump. “I just think Donald Trump is 100 percent unqualified in every single area,” he said. He was also troubled by Trump’s effect on the country. McCullum argues Trump’s rhetoric didn’t create more racism in America, but rather brought it to the surface. He called Trump’s language “charged” with implicit biases. Juan Garcia, who also studies political science at Benedictine, agrees. Though he describes himself as a “soft Republican” who supported John Kasich in the primaries, Garcia vowed not to vote for Trump. Though he cast a vote for Clinton, Garcia saw other millennial voters turning to third party candidates instead of casting a vote for Trump or Clinton. McCullum said the surge in third party support about younger voters was particularly telling about this election. Amid the nationwide anxiety over who will win the presidency, some voters in Chicago neighborhoods are looking at an issue that’s farther down the ballot. Paul Pater has been trying to get out the vote against a ballot initiative for new charter schools in Pilsen. Jolie Jimenez is also concerned about the expansion of charter schools. She taught jewelry making in after-school programs in Chicago Public Schools. But with budget cuts she lost her job. “For kids not to have such programs that’ll help them out maybe in the future – that’s kind of sad actually,” Jimenez said. Read our previous story on people trying to get education issues on the ballot in Chicago. Before a voting location at Cooper Dual Language Academy in Pilsen even opened today, poll workers were already on site before 6 a.m. There were already some logistical hurdles to tackle – like missing cards with information about the candidates. But some of the problems started at the door: election judges had to build a small makeshift ramp to make the polling location accessible to voters with disabilities, as required by federal law. Still, poll watchers like Rebecca Rivera, 56, have seen large numbers, especially Latinos, coming out to vote. Rivera is concerned that those with disabilities won’t be able to vote. She had a stroke, which affected her vision, so she needed to have the ballot read to her when she voted. Two judges, one Republican and one Democrat, had to be present to help her fill it out. Rivera and other female voters say they were motivated to cast their ballots because of sexist remarks by Donald Trump. Others were just as enthusiastic about voting for Hillary Clinton. Medill Reports reporter Duke Omara is in Highwood, where GOP Sen. Mark Kirk of Illinois cast his vote. Breaking away from tradition and party norms, Kirk voted for Gen. David Petraeus for president instead of his party’s nominee, Donald Trump or Democratic nominee Hillary Clinton. Kirk, who suffered a stroke a few years ago, walked unassisted from his car to the polling booth although he was using a cane. His voice sounded strong and he cast his vote. Defending his vote for Petraeus, Kirk said his choice was better than Clinton or Trump. The GOP leader said his aim was to take the most moderate voice to Washington. The 57-year-old Republican senator said he has been flexible enough to break from his party to advance Illinois interests. “I think there is a lot of explaining to do by the Justice Department to explain how they treated both case differently,” Kirk said. Petraeus, a former CIA director, disclosed classified information to his biographer. Petraeus pleaded guilty in 2015 to a misdemeanor charge of mishandling classified information. On the polls, Kirk insisted that he was only two points behind although most polls show him behind by double digits. “That’s a regret of mine,” the GOP leader said. CNN is reporting that lawyers for Donald Trump have filed a lawsuit against the Clark County registrar of voters over an early voting dispute. According to CNN, the lawyers claim that the registrar kept early voting locations “two hours beyond the designating closing time” around Las Vegas, where precincts have a higher minority population. A county spokesperson told CNN the locations didn’t extend their hours, but just “processed” voters who were already in line at closing time. Pride Action Tank, part of Aids Foundation of Chicago, posted a dialogue on how LGBTQ issues should be addressed in today’s local election. CAN TV host Maxx Boykin and Casimiro Peña of Chicago Votes’ Democracy Cup Fellow stressed the need to elect Chicago officials that will uphold the civil liberties of the LGBTQ community. “There are economic policies that are being created that determine how people’s gender expression is going to be considered in the political infrastructure,” said Peña said on CAN TV. The LGBTQ community would benefit from local policies addressing anti-discrimination in the workplace, as well as continued LGBTQ advocacy from elected officials, he added. Medill Reports has been covering the election leading up to Election Day. Here is a list of the most recent posts on various local races and aspects of the election. Today I’m a citizen. Today I vote. As Illinois students drown in debt, will elected officials come to the rescue? Residents in Illinois headed to the polls this morning to cast their ballots for president and other state positions. According to the Chicago Board of Election early Tuesday morning, roughly 325,000 had voted in Chicago. Medill reporter Christen Gall sent us this image from 15 W. Washington Street, considered a “super polling station” in the city. She was there approximately this time yesterday and the line was around the block. A spokesperson from the Chicago Board of Election said they planned to keep six to seven polling stations in different parts of the city open past the 7 p.m. deadline. However, he did not identify the polling stations and did not say when they would stay open till. Chicago Tribune also reported a midday lull, saying there were few voters at Farragut Career Academy in Little Village. Medill reporters Emily Olsen and Anna Foley are in the Chicago suburbs talking to people as they get ready to vote and participate in last-minute campaign efforts. Many of the people they’ve talked to today aren’t on board with Hillary Clinton or Donald Trump. Durschmid called the Republican Party “cowards” for continuing to back Trump. Though he said he supported Bernie Sanders for several months, Durschmid said he continues to align himself with the Green Party. 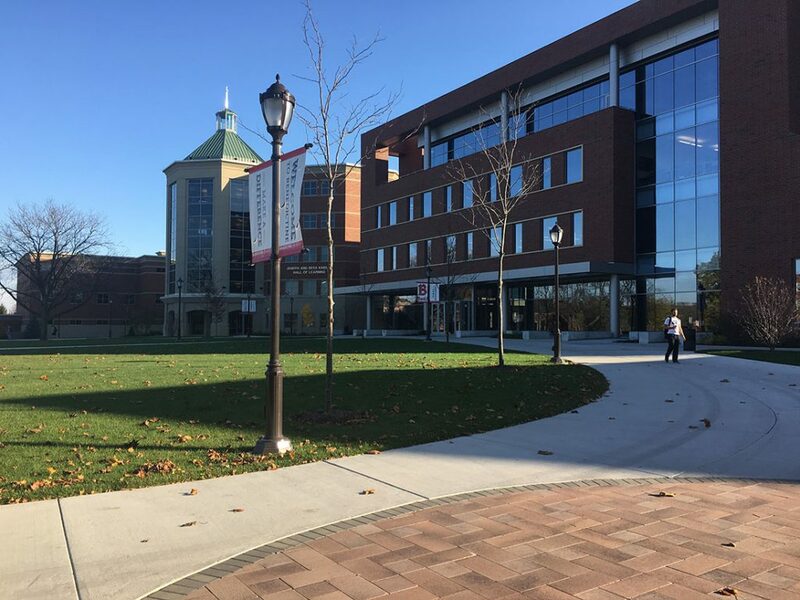 Allison Bassett, a sophomore at Wheaton College, is one of the independent voters that presidential candidates have been trying to attract in the final push towards election day. “Generally I don’t want to be tied to a certain candidate,” Bassett said. Bassett voted absentee in Colorado, a much sought-after swing state with 9 electoral votes. She ended up casting her ballot for Hillary Clinton, but doesn’t think either candidate was the best choice. “I’m not going to say I voted enthusiastically,” she said. Sophomore Justus Hanson voted for Donald Trump, though his choice for president changed frequently in the Republican primary. 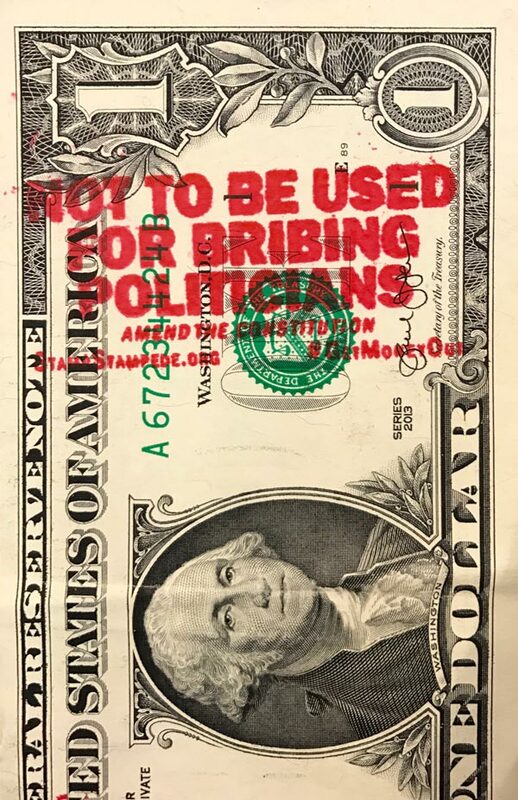 This dollar bill was given out to a customer at a store in Chicago this week.